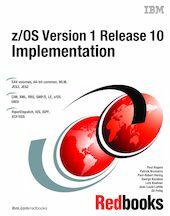 This IBM® Redbooks® publication positions the new z/OS® Version 1 Release 10 for migration by discussing many of the new functions that are available. The goal for the z/OS platform is to eliminate, automate, and simplify tasks without sacrificing z/OS strengths, and to deliver a z/OS management facility that is easy to learn and use. - An architectural limit of hundreds of terabytes (TBs) for DASD volumes, up from the current limit of approximately 54 GB per volume. Known as Extended Address Volume (EAV), this function is planned to initially support 223 GB per volume on z/OS V1R10 and IBM System Storage™ DS8000® , when available. - Up to 64 engines, up to 1.5 TB per server with up to 1.0 TB of real memory per LPAR, and support for large (1 MB) pages on the z10 EC, providing performance for critical workloads. - HiperDispatch can help provide increased scalability and performance of higher n-way z10 EC systems by improving the way workload is dispatched within the server. - Improved management for processor capacity via a new Capacity Provisioning Manager. - Improved productivity with simplifying diagnosis and problem determination. - Expanded Health Check services. - Automatic dump and re-IPL capability. - zIIP-assisted z/OS Global Mirror (XRC) and additional z/OS XML System Services exploitation of zIIP and zAAP help make these workloads more attractive on System z. A new SMP/E version helps simplify the task of verifying required software fixes identified in Preventive Service Planning (PSP) buckets. PSP buckets identify required software fixes for new hardware devices, toleration and coexistence of new software releases, and for enabling new functions.